Dakini Power honors contemporary female Buddhist teachers and practitioners. Unlike Rigpa, Shambhala immediately drew consequences. Shambhala International’s leader, Sakyong Mipham Rinpoche, has stepped aside, and the organization’s leadership, the Kalapa Council, resigned. When I discovered Tibetan Buddhism more than 20 years ago, the Tibetan Book of Living and Dying was one of the very first books I read, I attended retreats at Rigpa, but eventually left. I didn't know all the details back then, but I found Sogyal Lakar`s behavior and the atmosphere in the community disturbing. After speaking to some of the whistleblowers, the Secretary of His Holiness the Dalai Lama and many other students and teachers, I wrote about my research in 2017. You can read the article in English here and the German version here. Both the Dalai Lama and Mingyur Rinpoche encourage students to go public with issues of abuse and violence when they cannot be resolved internally. 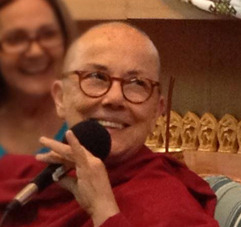 Some of the female teachers featured in Dakini Power, such as Lama Tsultrim Allione, Venerable Thubten Chodron and Roshi Joan Halifax have spoken out in support of the students who want to put an end to the abuse. This is a heartbreaking time for many students, and a pivotal moment for Buddhism in the West. How the Buddhist community responds will be crucial for the trust in the Tibetan Buddhist path. Rigpa and Shambhala are not the only groups that havee been criticized. Quite a number of serious allegations against teachers have rocked Buddhist communities in America, Europe, and Asia. I believe that in order for Buddhism to truly take root in the West requests for transparency and accountability can no longer be ignored. One of the many meanings of the word Dharma, after all, is “truth”. Jetsunma Tenzin Palmo remarked that sexual abuse—a “deep-rooted problem” in Buddhism and Western culture at large—has long existed underground. “As it is now coming more to the surface,” she said, “it may be very painful, but I believe that pain, if we embrace it with compassion and wisdom and understanding and acceptance, can heal." Below is a video extract from the conversation between Lama Tsultrim and Jetsunma Tenzin Palmo. I hope you find it helpful. The Swedish translation of Dakini Power just came out! 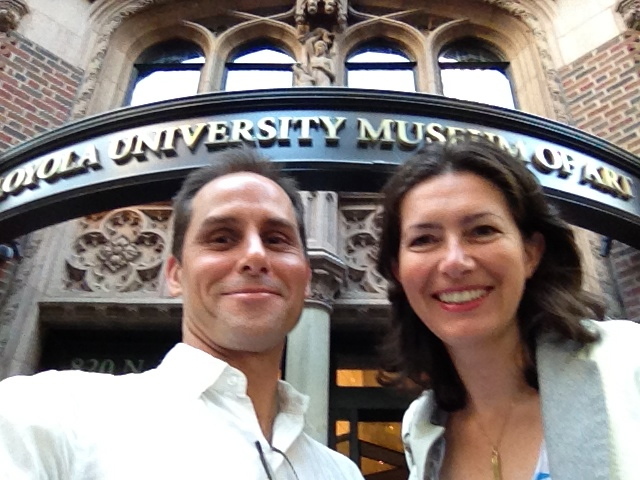 First Dakini Power event in Switzerland! In this Saturday morning talk, Michaela will present personal reflections and life stories from contemporary female Tibetan Buddhist teachers, both Westerners and Tibetans, who share insights into how they discovered their true calling, overcame barriers, and developed the courage, determination, and wisdom to progress on the spiritual path - including Pema Chödrön, Joan Halifax, and Thubten Chodron, among others. For an update on more events, please go to News & Events here. The German edition of Dakini Power has just been re-published with a beautiful new cover & new title as a brand new paperback edition. I LOVE the new cover! Get it here. Michaela's new book Bouncing Forward: The Art and Science of Cultivating Resilience is now available in hard cover, paperback, and audio (Atria/Enliven). It is full of Buddhist wisdom to turn life's challenges into a path to liberation. science of posttraumatic growth: A cutting-edge look at how trauma survivors find healing and new resilience. Learn more at www.bouncingforward.org. "Written for Buddhists and non-Buddhists alike, Michaela Haas examines the science of post-trauma recovery with an eye to the similarities between Buddhist mind training and Western trauma psychology. ... Bouncing Forward focuses on developing a deeper perspective through mindfulness, compassion, and wisdom when life seems too hard to bear." The uplifting science of posttraumatic growth presents groundbreaking research and proven methods to survive and thrive in the face of challenges. Twelve inspiring role models share their profound insights on how they emerged from hardship stronger, wiser, and more compassionate—from civil rights icon Maya Angelou, who healed deep childhood trauma; flight surgeon Rhonda Cornum, who found a new purpose after being captured in Iraq; renowned autistic pioneer Temple Grandin, who overcame crippling panic attacks; and famed jazz guitarist Coco Schumann, who played for his life in Auschwitz. In Bouncing Forward, Michaela Haas draws upon powerful storytelling, psychology, history, and twenty years of Buddhist practice to reshape the way we think of crisis. Unlike books from the medical community, Bouncing Forward is a user-friendly source of techniques actual trauma survivors have used to benefit from pain and adversity. Haas draws on common coping threads to beautifully combine inspirational stories of growth through trauma with science and spirituality. Perfect for people from all walks of life who are recovering from loss, pain, illness, and violence—as well as their friends and family—Bouncing Forward offers examples and inspiration for growth and a mindful approach to dealing with suffering, and finding a deeper meaning in life. Get your copy now, and meet Michaela on her book tour. Our heart goes out to the earthquake victims in Nepal. Nepal was hit by a catastrophic 7.8 earthquake on April 25, 2015. The death toll is mounting rapidly, it's heartbreaking. All the friends and monasteries there we're connected with are safe, but we still worry greatly about many others. Our friends at Shambhala Sun have put together a list of trustworthy aid organisations here. Please donate any amount you can. Nepal needs help urgently. The Spanish edition of Dakini Power is here! "Me llena de satisfacción leer en este libro las historias de los logros que estas mujeres, maestras de las diversas escuelas del budismo, han culminado. Celebro la contribución que las mujeres practicantes han aportado a lo largo de la historia, así como la que aún continúan ofreciendo. You can now listen to Dakini Power for free if you sign up for a 30 day free trial with Audible. Check it out here and here! His Holiness the Karmapa is visiting the US! Big news! HH the 17th Karmapa (who kindly wrote a brilliant foreword to Dakini Power and recently showed his support for Buddhist women by announcing that he will reinstate bhikkuni ordination) will visit the US this year! He will be in Seattle from May 5-11, 2015, due to requests by Dzogchen Ponlop Rinpoche. Further details of the broader tour within the U.S. are still being worked out. Please mark your calendars and join in the rejoicing! "People are my Forest: A Female Monastic's Fearless Response to Misogyny and Indifference in the World"
The Polish translation of Dakini Power is coming soon! w trwającej na ten temat dyskusji." Lama Tsultrim Allione`s visit to Shambhala LA was wonderful! We watched a film tribute to her late husband David Petit, and the fabulous new documentary film "Feeding Your Demons" about her life and work. She spoke passionately about her vision of starting a movement of "Rising Wisdom," designed to "reawaken the sacred feminine and bring it to the tables where decisions are made for all of us." Bring it on! The Dakini Power audio book is now available for download on Amazon, Audible, and iTunes. Veronica Newton, a student of the Dzogchen Ponlop Rinpoche, did a marvelous job in bringing the voices of Dakini Power alive. Listen in on the free trial here! We just received a new shipment of our Dakini Power hats and will offer them during the holiday season at 20% off. Proceeds support the education of girls and women in Asia. Look at our other gift ideas and get your Dakini Power to wear here! Dakini Power: Zwölf außergewöhnliche Frauen, die den heutigen Buddhismus prägen has just been published in Germany on October 1st, 2013, with the wonderful publishing house O.W. Barth. Read the first book reviews and watch Michaela Haas` book launch presentations here! New York, New Orleans, and Chicago were a blast! Exclusive Bonus - Read an interview with Ven. Robina Courtin about her life, her work, and her practice of "radically working with one´s own mind"! Right now, Dakini Power is a book about 12 women, but it really is only the beginning in our vision to create a platform and network for female Buddhist teachers and practitioners (and men!) to communicate, exchange and share inspiration and challenges across sanghas and traditions. Many of you have shared your stories of inspiration in the blog – thank you! – and if you haven’t yet, please do so. We aspire to include more interviews and profiles of wonderful teachers, and it is part of the great joy of having published this book to discover new role models. For a limited time only we are offering an exclusive interview with the wonderful Australian teacher Ven. Robina Courtin! Read the full interview for free after you sign up for our mailing list here. At first we only made a few hats and tees for our friends, but now everybody wants them, so we made more. Proceeds will be used to sponsor the education of girls and women in Asia. Get your Dakini Power to go here! 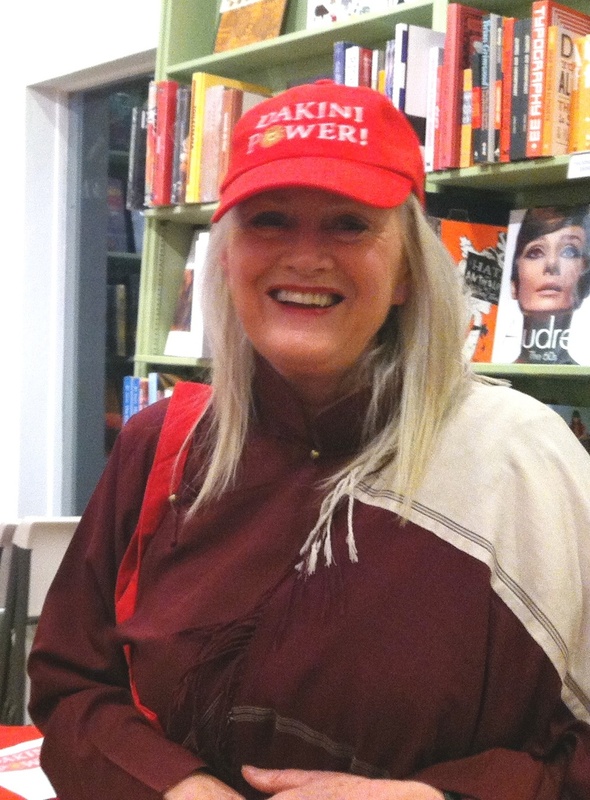 Our favorite Dakini, Lama Tsultrim Allione, with her Dakini Power hat! Staff recommendation at Powell's Books. Thank you! 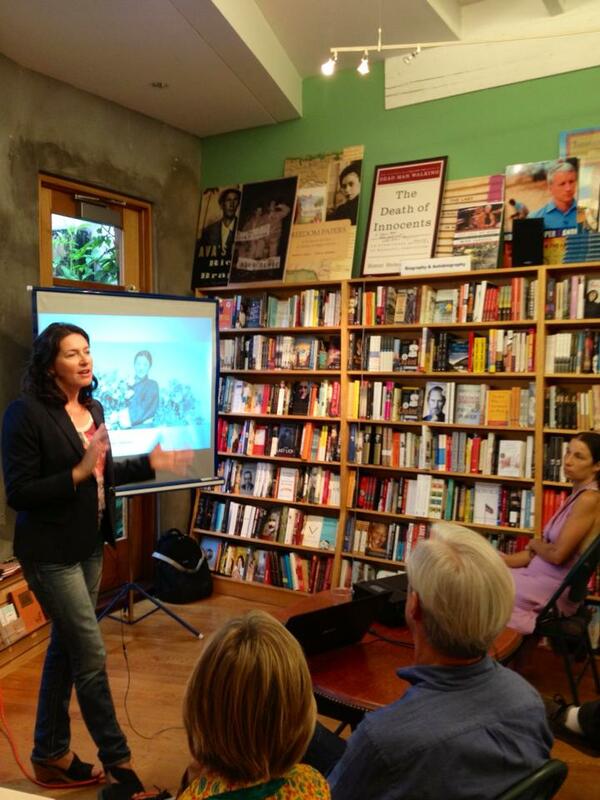 Thank you, Lisa Napoli and Michael Krass, for a wonderful book discussion at Insight LA in Santa Monica. I have always loved Lisa Napoli`s radio program and being interviewed by her is a true honor. We had great questions, a full house and an enthusiastic audience at an outstanding Dharma Center. I enjoyed every minute of it. Buddhists all over the world celebrate Buddha's birth and awakening this month as the most sacred and auspicious time in the Buddhist calendar. Happy Saga Dawa! Dakini Power celebrates by sponsoring a girl to continue her university education for an entire year to become a nurse, a doctor, a lawyer, or a teacher. All our t-shirt sales and proceeds until June 16th 2013 will be donated 100% to this purpose. Find out more here! Giveaway: We Have Two Lucky Winners! The book and website are dedicated to celebrating the accomplishments and life stories of the women featured in this book and many more. Why stop with these twelve? In the comment section in the Blog here, please share your story of how female practitioners have inspired you. 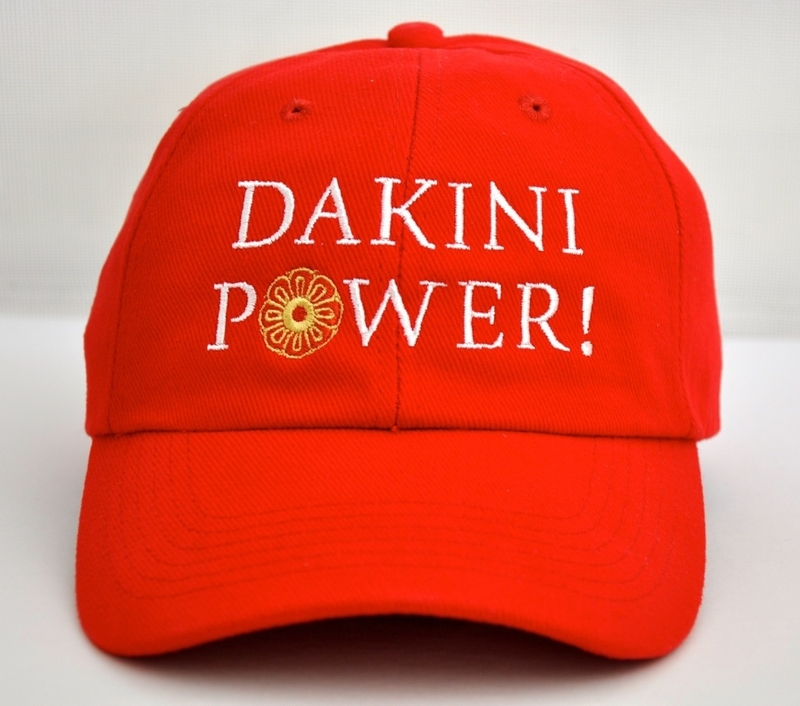 Thank you to all who shared their inspiring stories, and to Mary and Danie, who won a Dakini Power hat and tee in our Giveaway on Dakini Day, June 3rd. Please continue to share and discuss! The Dalai Lama's enthusiastic 'yes' to a female successor in a new TV interview is making headlines. Author Michaela Haas has just discussed this possibility in a recent article: A Female Dalai Lama? Why It Matters. His Holiness the Dalai Lama gave several outstanding talks in Portland, OR, during his recent visit. He got a lot of laughs and applause when he said at the University of Portland: "Biologically women care more, so its not wrong to say, men create the problems." He also connected deeply with Grandmother Agnes Baker Pilgrim, an indigenous elder, who said at the same event: "It is always us women who have an umbilical cord attached to the earth, because we are the givers of life." Several of the teachers featured in Dakini Power attended as well: Dagmola Sakya, Venerable Thubten Chodron, and Sangye Khandro. 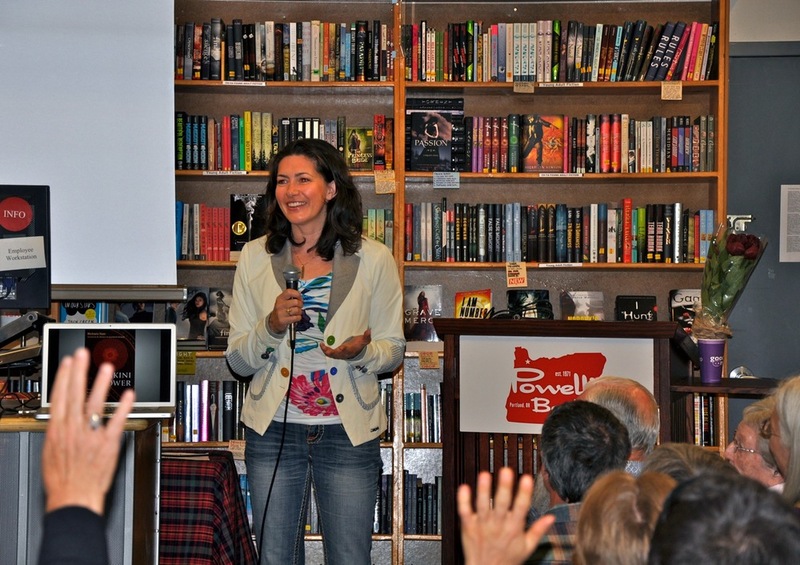 We had a wonderful book talk at Powell´s Books. What a great crowd! 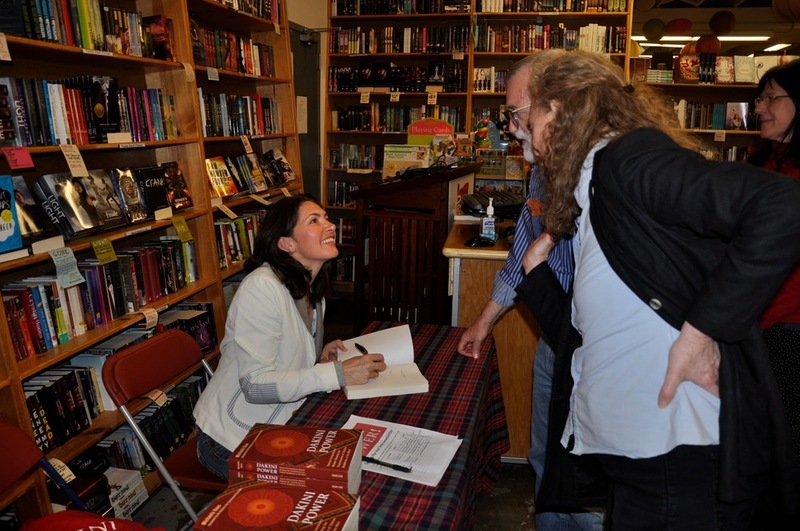 About 50 people attended, asked fabulous questions, and the book sold out. Portland rocks! "The dakini is not far away. We all have that potential. When you want to accomplish something, you always invoke the presence of the dakinis. With this book, Michaela has invoked this presence. Making this book and calling it Dakini Power is really invoking that enlightened activity in all of us. Having this book out there with this name has a power. I feel like this book is a really important book. It is so inspiring to hear the stories of these women, how each one of them has met the challenge and gone beyond of what she thought she could do. They all embody and express this courage, in a very unassuming way. The main message or point of the book is, yes, there are these women, and they have these qualities, but so do you. We all have the dakini within us. Find her and play with her, and feel all the levels of her in us and in the world. We need her. We need the dakini energy, for us to survive, for the earth to survive. Why do we need it? Because we have become so materialistic, so caught in speed. Faster, faster, faster. We had a full house, wonderful guests, and perfect hosts. Thank you, Diesel Malibu! "The path to enlightenment which the Buddha taught was for all sentient beings, for women as well as men. In the past there were many great women practitioners, such as Mahaprajabati Gautami, who was both Shakyamuni Buddha's adoptive mother and the first woman to be ordained into the sangha he established. Buddhist texts also refer to female Arhats. Equal practice opportunities were given to both men and women, and the four pillars of the house of Buddhism include ordained nuns and lay women. I am heartened to read the accounts in this book of the achievements of women teachers from different schools of Buddhism. It is a celebration of the contribution which female practitioners have made throughout history, and which they are continuing to make. Unfortunately, influenced by the views and customs of the time, too many societies have put too much emphasis on the difference between men and women, and this has led to discrimination against and unequal treatment of women in many religions, including Buddhism. My heartfelt prayer is that women such as these are the trailblazers, their efforts will lead to a fresh recognition of the unique insights and qualities of female spirituality , and wider acknowledgement of women practitioners and teachers."